TMNT Entity: New Comic Day! Across the rooftops of Manhattan, Mikey hurries back to April’s apartment with a satchel strapped over his back. Entering through the window, he remarks how much he loves “new comic day”. Mikey calls out to Don, saying he’s got him the latest issue of “American Splendor”, but no one’s home. Noticing a comfy-looking new armchair, Mike takes a seat and passes out. He’s awoken by a rumbling sensation and when he comes to, the armchair has transformed into a robot! The robot attacks and Mikey dives out of the way. Whipping out his nunchakus, Mike fights back, but his every blow is met with soft, yielding cushions. The robot smacks him to the ground and moves in for the kill. Helpless, Mikey screams for his life. *Among the comics Mikey has purchased are “American Splendor”, “Nexus”, “Trollords”, “Watchmen” and “Flaming Carrot Comics”. 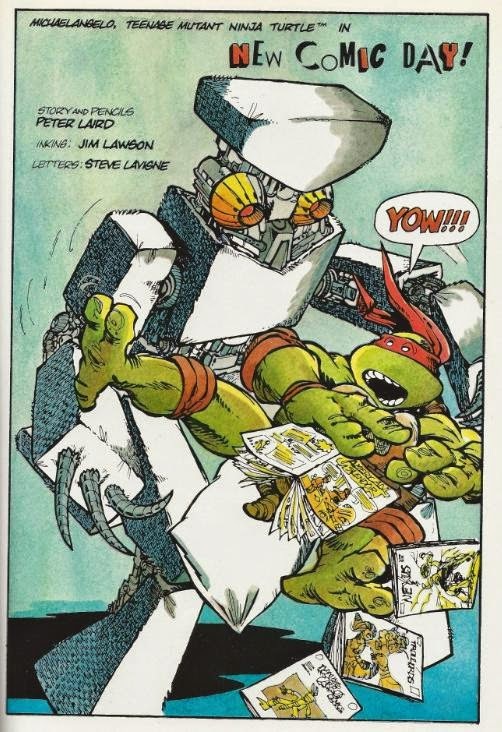 I’ve remarked in some of my other reviews that there are a metric ton of these back-up shorts that feature the TMNT encountering some completely bizarre, goofy foe with nary a shred of explanation behind it. Did Don build the robot chair? Was it an alien? Did Mike dream the last few panels of the comic where it comes to life for real? Am I thinking too hard about this? Well, the answer to that last question is pretty obvious, but still. 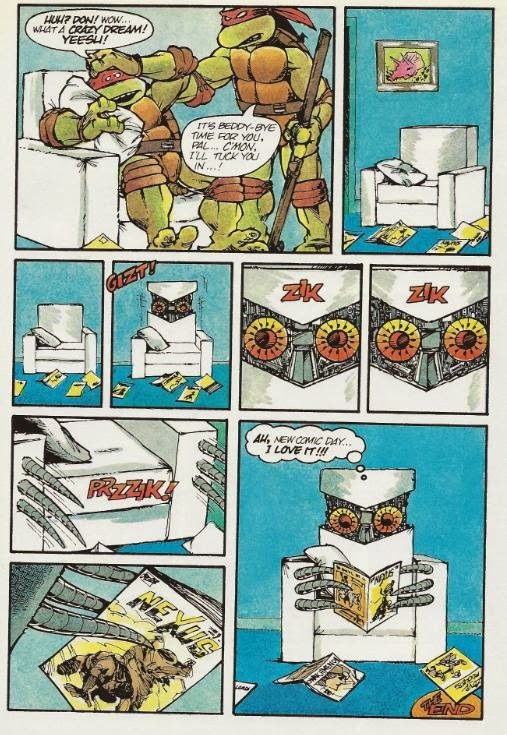 “New Comic Day!” is another fun diversion into Wacky Land for the TMNT and amusing at six pages. I, too, look forward to Wednesday as new comic day and have since I got my first subscription box almost ten years ago. Though Don reads “American Splendor”? Yuck. Laird’s design for the armchair robot is actually pretty cool and I’d sort of like a Transformer toy of the thing. Couldn’t be that hard to engineer. Having read both the color and black and white versions of the comic, I find that they’re both on equal footing. Unlike some shorts, such as “The Road Trip”, the color here doesn’t add a whole lot of atmosphere or anything of that nature to give it an edge over the black and white version. So if all you’ve got is the “Shell Shock” version then I wouldn’t say you’re missing anything. I've always liked this story, and yes the chair would have made a great toy!